The powerpoint presentation and the Podcasts of the first workshop in Mexico are now online and can be accessed here. Hans Günter Brauch, Úrsula Oswald Spring, Czeslaw Mesjasz, John Grin, Pal Dunay, Navnita Chadha Behera, Béchir Chourou, Patricia Kameri-Mbote, P.H. Liotta (Eds. ): Globalization and Environmental Challenges: Reconceptualizing Security in the 21 st Century. Hexagon Series on Human and Environmental Security and Peace, vol. 3 ( Berlin – Heidelberg – New York: Springer-Verlag, 2008). Hans Günter Brauch, Úrsula Oswald Spring, John Grin, Czeslaw Mesjasz, Patricia Kameri-Mbote, Navnita Chadha Behera, Béchir Chourou, Heinz Krummenacher (Eds. ): Facing Global Environmental Change: Environmental, Human, Energy, Food, Health and Water Security Concepts. 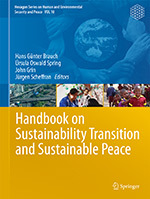 Hexagon Series on Human and Environmental Security and Peace, vol. 4 ( Berlin – Heidelberg – New York: Springer-Verlag, 2009). November, 30-1 December: 12th EFGP Council Meeting, Hotel Agro, Budapest, Hungary; presentation by H.G. Brauch on: "New Security Challenges in the 21st Century". September, 8-10, Fourth Pan-European Conference in International Relations at the University of Kent at Canterbury. AFES-PRESS Canterbury Workshop. Results have been published in June 2003 by Springer. June, 5-6: Third GMES Forum in Athens, Greece organised by the EU Commission and ESA; paper by H.G. Brauch on: "Security Linkages Among Fatal Outcomes of Global Environmental Change: Natural Disasters, Environmentally-induced Migration, Crises and Conflicts - GMES Contribution to EU Policies for Conflict Prevention"
January, 28-29: Eurisy Workshop in Matera (Italy) on Security: Services and Benefits from GMES, supported by the Italian Space Agency, Telespazio, the Council of Europe, EC/Joint Research Centre and the European Space Agency; keynote address by H.G. Brauch on: Environment and Security Challenges in the Mediterranean until 2050 - Potential Contributions of GMES to Reducing Natural Disasters, Environmental Migration and Avoiding Conflicts. December, 5-6: Conference of the ProVention Consortium at the World Bank on: Building Safer Cities; talk and paper by H.G. Brauch on: "Urbanization and Natural Disasters in the Mediterranean - Population Growth and Climate Change in the 21st Century" for a (5 December 2002) Download here: Text. November, 29-30 in Malta: Conference of Mediterranean Greens; talk by H.G. Brauch on: "A Survival Pact for the Mediterranean: Linking "virtual water" and "virtual sun". July, 15-17: First GMES Forum in Brussels at a workshop by the EU Commission and ESA; keynote address by H.G. Brauch on: ): Environment and Security Challenges in the Mediterranean until 2050 - Potential Contributions of GMES to Reducing Natural Disasters, Environmental Migration and Avoiding Conflicts (16 July 2002). June, 26, The Hague: International Conference on Climate Change and Disaster Preparedness, organised by the Dutch Red Cross, the IFRC, The Ministry of Foreign Affairs of the Netherlands; presentation by H.G. Brauch on: "Climate Change, Environmental Stress and Conflict - Cases of Bangladesh and Egypt" (pdf-file, 2,3 MB). June, 20-21, Berlin: Foreign Ministry of Germany: Symposium on Disaster Reduction and Global Environmental Change"; presentation by H.G. Brauch on: "Vulnerabilities due to Environmental Degradation - A Human Security Perspective on Disaster Reduction" (pdf-file, 1,1 MB). June, 10, Bonn: Side Event at SBSTA 16: presentation by H.G. Brauch on: "Climate Change and Conflict Prevention" (pdf-file, 1,8 MB).